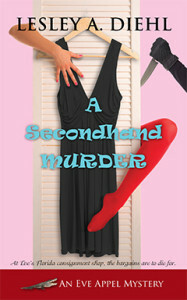 A Secondhand Murder is the first book in a new mystery series featuring amateur sleuth, Eve Appel. Lesley has five other published mysteries: A Deadly Draught, Poisoned Pairings, Dumpster Dying, Angel Sleuth, and Grilled, Chilled, and Killed. “Lesley A Diehl is a very clever writer. Most of the time I can figure out the murderer in a book but this one kept me guessing right until the end.” Read more …. “Fun from Page one! …. Not only is A Secondhand Murder filled to the brim with entertaining characters, but the mystery contained in its page is also well crafted. Everyone, even Eve, seemed to have some sort of secret. I enjoyed peeling back all the layers of this story as I tried to figure out what was related to the murder and what wasn’t. I absolutely enjoyed reading A Secondhand Murder. The web of murder and deceit is well spun, but the characters Ms. Diehl has created are truly the shining stars of this book. Anyone looking for a laugh out loud, fast paced mystery would do well to pick up A Secondhand Murder today.” Read more …. “A full cast of zany and dangerous characters makes this cozy mystery a fun read. With laugh out loud scenes and some scary moments, this book is so hard to put down and when the end did come, I found myself wondering what madcap adventure awaits the reader in the next book. I loved it! !” Read more …. “I’ll have to personally recommend this book to all of friends who love cozies. It’s a great mystery, with a little suspense, a little romance, some slapstick, and most of all, characters who feel like family. I read it in one sitting. Is it one sitting if you stop to put another log on the fire, pour a tall glass of apple pie vodka and let the dogs out? At any rate, I didn’t want to stop reading, and stayed up late to finish. It was worth it.” Read more …. “Author Lesley A. Diehl blends humor and suspense into a delightful tale of intrigue. Diehl has created likable, realistic characters that will have you laughing as you try to guess who the killer is. A Secondhand Murder flows at a steady pace with some interesting twists along the way. The setting is inviting and the story will draw you in.” Read more …. “An extremely fun and wickedly entertaining cozy mystery. The quirky characters and the complex entanglements each of them have with the deceased and the protagonist is the best part of the book. The author creates a well-plotted, light-hearted mystery that has some really good laugh out loud scenes. Cozy mystery lovers will thoroughly enjoy A Secondhand Murder; it is an outstanding read from beginning to end.” Read more …. “Humor, adventure, mystery and romance are all blended together to make this a fun few hours of reading. The book kept me guessing until the end—I kept changing my mind about who the killer was and I guessed wrong. LOL—This was a good thing. I enjoyed this one. This is the first book in the series and it’s already off to a great start.” Read more …. “[A Secondhand Murder] will delight you. It has a little bit of everything that you want in a murder/mystery, complete with romance!” Read more …. “I really enjoyed the page turning action that even involved getting help from a Mob boss. The story was complex but very easy to follow. The quirky characters including Eve lead the reader through lots of excitement…. I wholeheartedly recommend this cozy for all cozy mystery readers.” Read more…. “There were so many characters that I really enjoyed everyone from Eve’s crazy ex-husband Jerry to Alex the Private Investigator to her grandmother and grandfather. They all had their quirks that I loved. Definitely a great new refreshing series that I can’t wait to read more when the author writes more!” Read more …. Spunky and outspoken Eve Appel moves from Connecticut to rural Florida intent on starting a new life, free of drama, and more importantly, her soon-to-be ex-husband. The rural Florida town of Sabal Bay, situated only an hour from West Palm, proves to be the perfect spot for her consignment store. Thanks to the recent economic downturn, Florida’s society matrons need a place to discreetly sell their stuff and pick up expensive-looking bargains. But Eve’s life, and her business with it, is turned upside down when a wealthy customer is found stabbed to death in a fitting room. As accusations fly and business slows, Eve decides to take matters into her own hands. With the help of an unlikely bunch of friends—including her estranged ex, her best friend, a handsome private eye, and a charming mafia don—she struggles to find answers and save lives. Through a maze of distorted half-truths, dramatic cover-ups, and unrequited passions, Eve learns just how far the wealthy will go to regain what they have lost. Lesley A. Diehl retired from her life as a professor of psychology and reclaimed her country roots by moving to a small cottage in the Butternut River Valley in upstate New York. In the winter she migrates to old Florida—cowboys, scrub palmetto, and open fields of grazing cattle, a place where spurs still jingle in the post office. Back north, she devotes her afternoons to writing and, when the sun sets, relaxing on the bank of her trout stream, sipping tea or a local microbrew. You can find Lesley online here. It was still early so I strode back into the restaurant, indicated to the hostess I wanted a booth and ordered the breakfast buffet. Anger paired with disbelief gave me a hearty appetite. Returning to my booth after loading my plate with eggs, bacon, pancakes, pastries and a slice of toast, I noticed someone had joined me for breakfast. He was seated with his back to me as I approached the booth but I recognized the sun-streaked hair curling over his collar. My favorite PI. I almost dropped my plate. “Hi.” I tried for nonchalant but sounded more like a hormone-addled teenager. “Fingerprints?” He stirred a packet of sugar into his coffee. “So you say, but my sources indicate that’s not the whole story.” He stared at me. Last night I thought those azure eyes looked inviting. Now they looked more like ice. He smiled. “Don’t get mad. I’m not accusing you of murder, you know.” He took a sip of coffee. “I’m not mad.” I was a little miffed, peeved even, but not really mad. Okay, I was mad. “That would be …?” He also stood. I stalked out of the restaurant, then remembered as I approached my car that I had forgotten to pay my bill. Damn. Now I’d have to go back in there and face him again. I gritted my teeth, stuck out my chin and slammed through the door. He turned from the counter, credit card in hand. “There won’t be a next time.” I spun around and pushed open the door. By the time he reached his car, I was already starting my engine, wondering what the man knew about Mrs. Sanders and me.